Labels may be applied on the product from all sides on a flat surface, on a cylinder resp. by corner wrap labeling. The vacuum belt applicator is positioned in front of the peel-off plate. 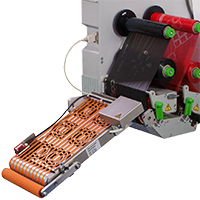 The printed label is moved to the labeling position via vacuum belt and applied on the packaging via external signal. Printing and labeling may be done simultaneously. Especially for two-color printing and applying in real-time. The product speed must be higher than the vacuum belt speed.